Whereas The Case Against Homework is a book for parents by parents, The Homework Myth is more of a scholarly rebuke of homework as it currently stands in American schools. The Case Against Homework lays out countless anecdotes that illustrate the downside of homework, as well as step-by-step strategies to address homework issues. 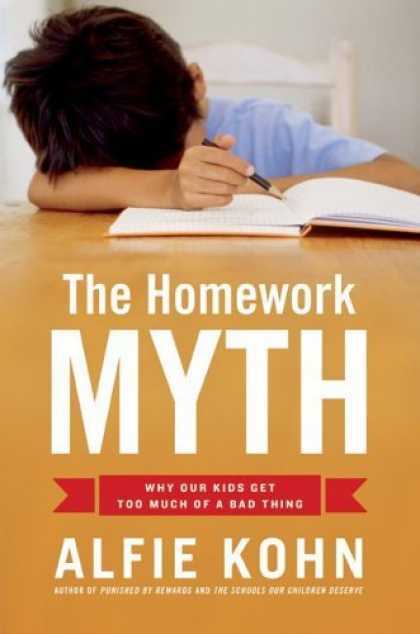 The Homework Myth, in down-to-earth terms, addresses the most common arguments made in favor of homework, and deconstructs the studies that supposedly support homework as an institution. As I read Kohn’s book, I found myself almost laughing because I have indeed encountered all the very same arguments in favor of homework at my own kids’ school – arguments that really don’t hold water when you examine them: the “reinforcement” argument; the “BGUTI – or Better Get Used to It” argument; the “parents demand homework” argument; the “homework teaches responsibility, blah blah blah” argument. They’re all pretty much hooey. So why does homework persist? In short, we are a competition-driven culture, our schools are driven by standardized test scores, and test scores have become the measure of achievement for school-aged children. And at what price? stressed out, burned out kids who are not being encouraged to develop critical thinking skills, creativity, inquisitiveness, or a passion for learning. If you are a parent who is fed up with the homework problem, this book will validate your feelings of frustration. I would recommend it to not only every parent with school-aged children, but educators as well.